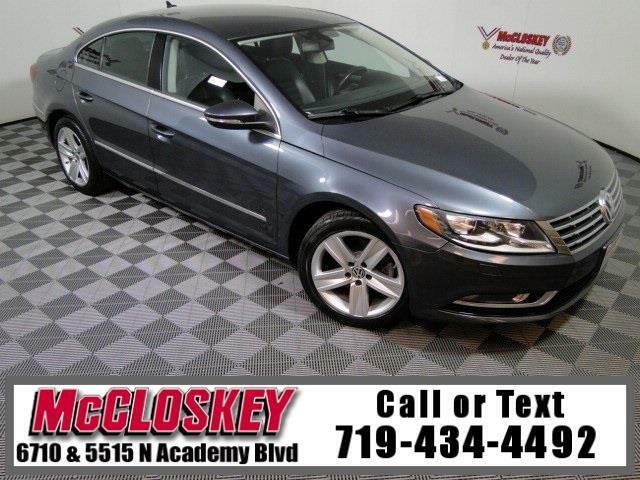 Sporty and well-appointed 2014 Volkswagen CC 2.0T Sport with Keyless Entry, Backup Camera, Heated Leather Seats, Fog Lamps, and AUX Connection! The base Sport comes standard with 17-inch alloy wheels, foglights, automatic wipers, automatic bi-xenon headlights, LED taillights, LED daytime running lights, dual-zone automatic climate control, rear air vents, cruise control, heated eight-way power front seats (with four-way lumbar), a leather-wrapped tilt-and-telescoping steering wheel, an auto-dimming rearview mirror, Bluetooth phone and audio connectivity, Volkswagen's Car-Net telematics, a navigation system and an eight-speaker sound system with a touchscreen interface, a CD player, satellite radio, an auxiliary audio jack and an iPod interface. This vehicle passed our 110 multi-point inspection and is backed by our National Quality Dealer of the Year Award. We are an ''A+'' Better Business Bureau Rated Business. We offer low interest rate financing, low down payments and the highest trade allowances in the state! Here at McCloskey we do things a bit differently, we shop our competition every day to ensure a great value to you. Come on down and experience it for yourself. This McCloskey Assured vehicle includes a 2 month/2000 mile Warranty and a Vehicle History Report!! At McCloskey we strive to provide ASSURANCE, TRUST, VALUE AND QUALITY! Call 719-434-4492.